Buttery round shortbread cookies, baked to the perfect crunch and iced, then printed with your custom design or logo along with a QR code that can be scanned by a phone. Individually cello wrapped. Bow optional. A complete unique custom cookie of the future. These cookies can be printed with a QR code and then scanned with a smartphone, taking you to a website. You can use these cookies as part of a marketing campaign or as promotional gifts. Everyone will want to scan the cookie before they eat it, making it a powerful marketing tool - and delicious, too! 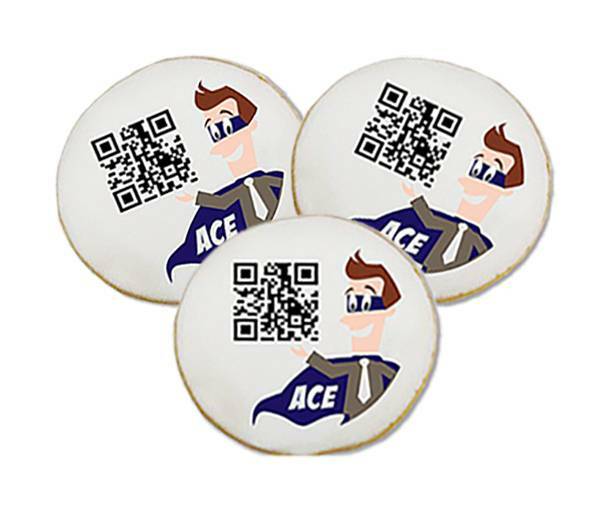 We pioneered these QR code custom cookies years ago, immediately seeing that we could use our full color proprietary printing process with crisp designs directly on the icing. We never use edible paper because the taste, texture and inclination to peel ruin the effect. Every cookie should be nothing but sweet, melt-in-your-mouth perfection. Perfect for corporate events, trade shows, job fairs - anywhere you need to stand out and make connections.